Boy-oh-boy! I have the most amazing art project to share with you! 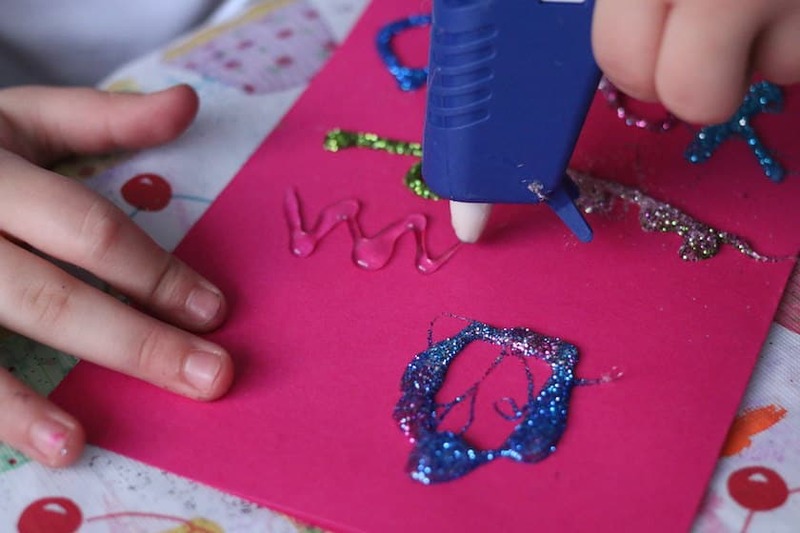 We did a completely new and experimental art process today, and created some dazzling 3-D art with a glue gun and glitter. Yep. 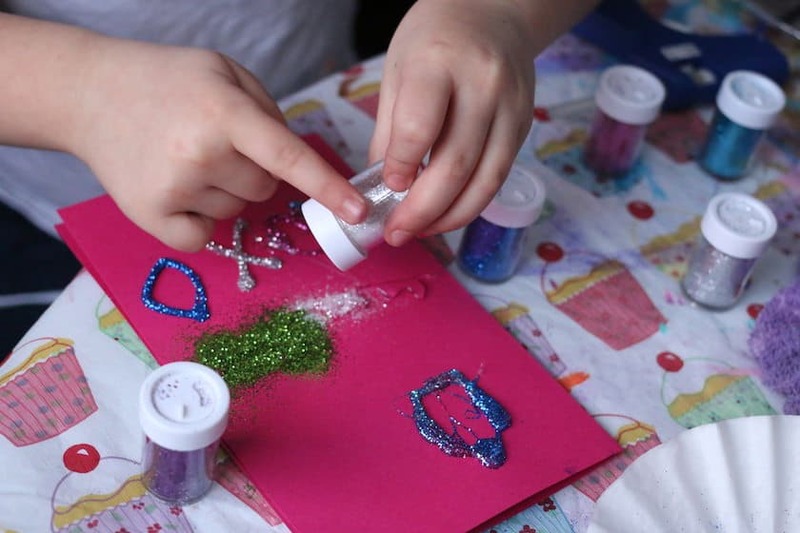 A glue gun and glitter. Why have I never thought to combine these two things before? Look at the results! They’re GORGEOUS! And the process is SO easy!! 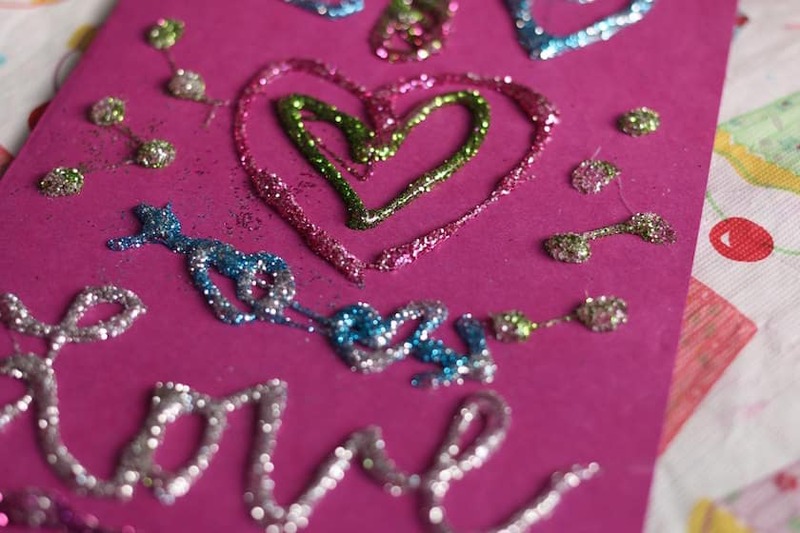 Today, we’re using our glue gun and glitter art to make Valentines cards, but you and your kids can use the process to make to make any kind of homemade greeting card or even a custom piece of art work for a bedroom or a classroom. I’m so excited! 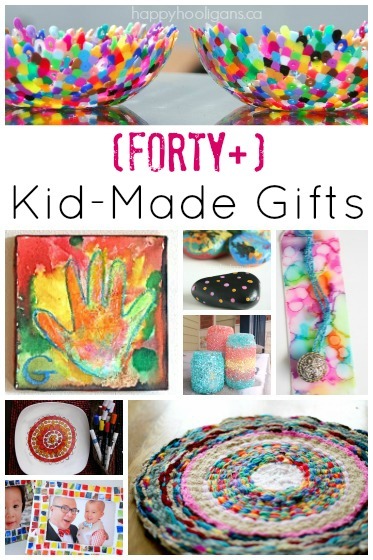 My wheels are turning, and I’ve already planned out a few more glittery glue gun projects to do in the weeks to come. I’ll share them here on my blog of course, so be sure to stay tuned! Use that red bar at the top of my site to sign up to receive my blog posts by email. You really need to do that because you can’t rely on Facebook to show them to you! When you subscribe by email, every post I write will be delivered straight to your inbox when I hit “publish”. Ok. Back to our glue gun project. Maybe it’s never occurred to me to use glue gun and glitter together because I’ve never been a fan of glitter. In fact, I’ve always joked that I’m a self-proclaimed glitterphobe. I don’t know what’s come over me this past week, but we’ve busted out the glitter almost every day, and not only am I coping. I am THRIVING. I am embracing the glitter, folks! Did you see our Valentines houses? Glitter. Our Tea Light Luminaries? Glitter. And I have another glitter post coming up in the next day or two. That’s 4 Glitter posts in one week! I feel like I’ve entered a whole new world. 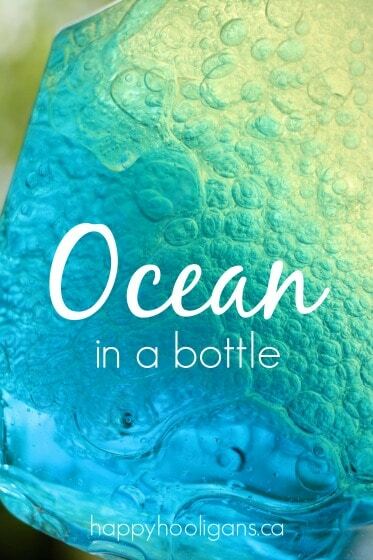 And I quite like it. It’s very sparkly. 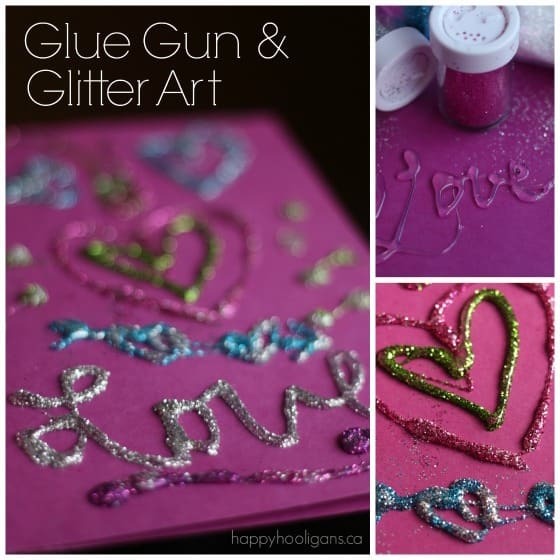 Ok, let me show you how we made our simply awesome 3-D glitter and glue gun art. I think you’re going to like this! Ok! Time to have some fun! 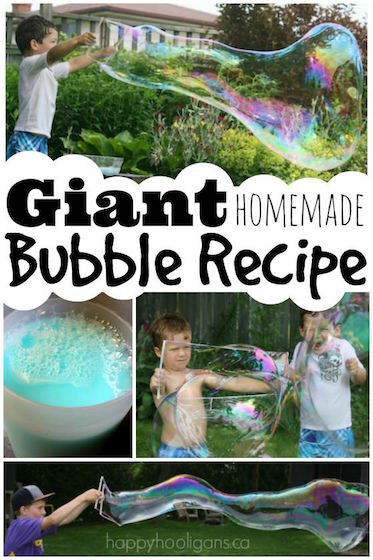 We used a low-heat glue gun for this project because kids and high-heat glue guns aren’t always a great combination. *Whenever I’m using glue guns with kids, I keep a bowl of cold water next to us so they can dip their fingers in if they get any glue on them. 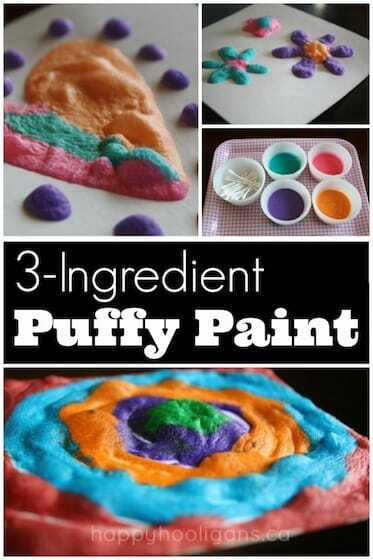 I do this when I’m working with my high-heat glue gun too. It has saved me from many a burn. Start by folding a piece of card stock in half to form your Valentines card. Plan out the message you want to write, and get an idea of where you’re going to write it on your card. 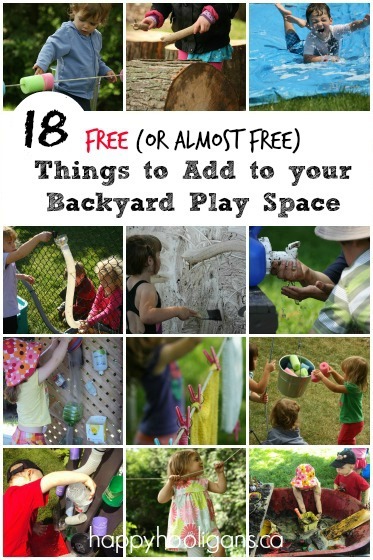 Kids might want to pencil their message or design on first, and then follow the lines with their glue gun. Next you’re going to write your message with your glue gun. 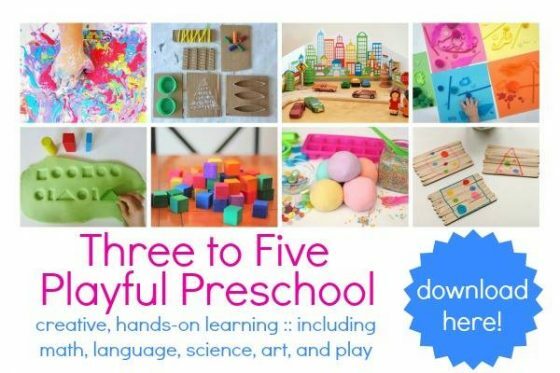 This is a fantastic exercise in fine motor control and concentration. And then you’re going to sprinkle glitter on top of your message. Here’s the thing though. You want to work one word at a time. Write a word. Sprinkle with glitter. Write another word. Sprinkle with glitter. 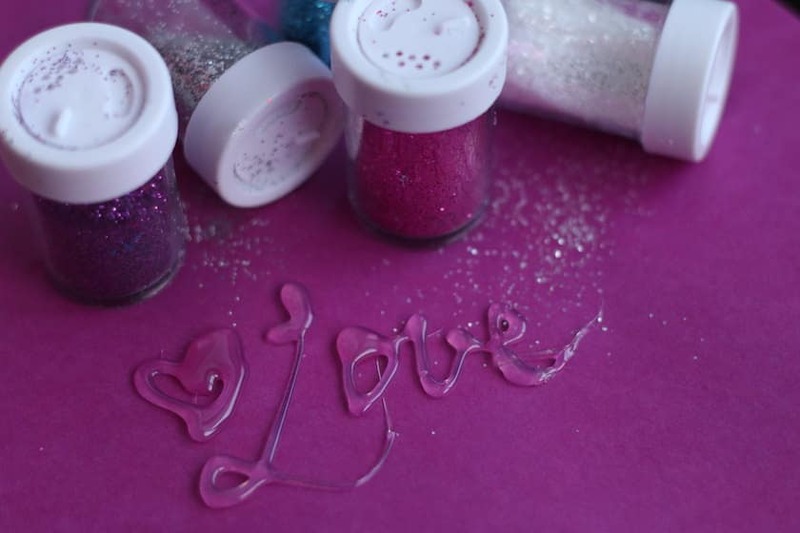 If you write too much at one time, the hot glue will cool by the time you want to glitter it, and the glitter won’t stick. 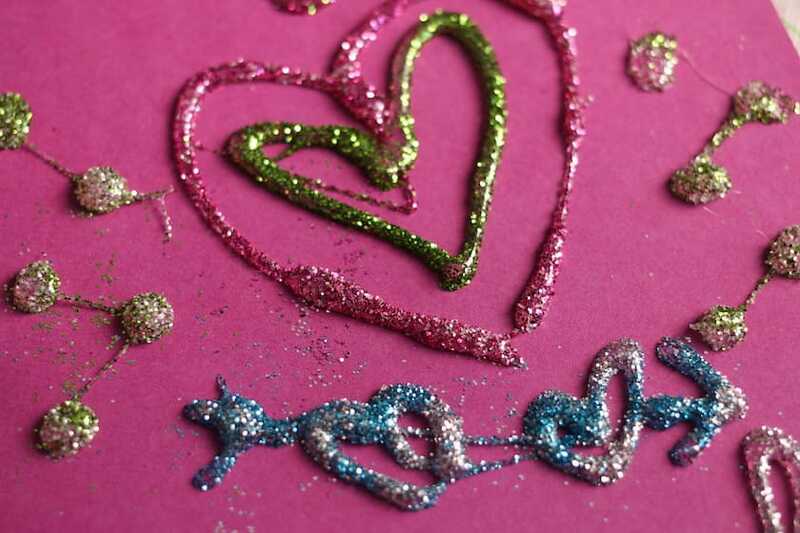 So for instance, on this card, my hooligan drew the zig-zag, and then glittered that. Then she drew and glittered the heart, and then the x’s and o’s etc. 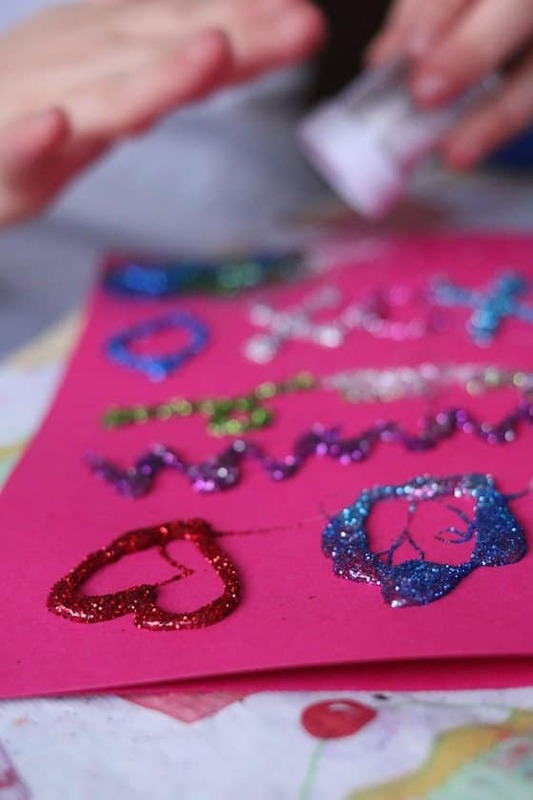 After sprinkling each word or design with glitter, we tapped the excess into a paper coffee filter. Then when we were finished, we tipped all of that excess into a container so we could use it another time. 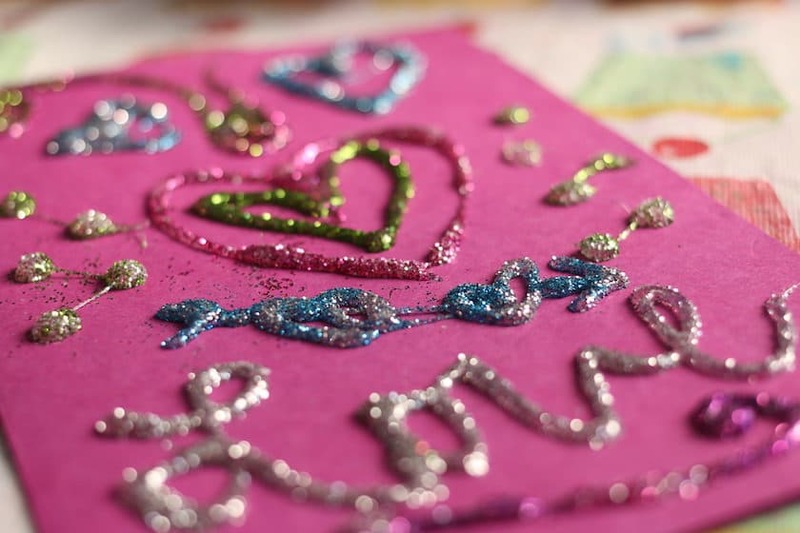 Just look at how gorgeous our glittery designs are! I love how the letters and designs are so puffy, and how they sparkle in the light! 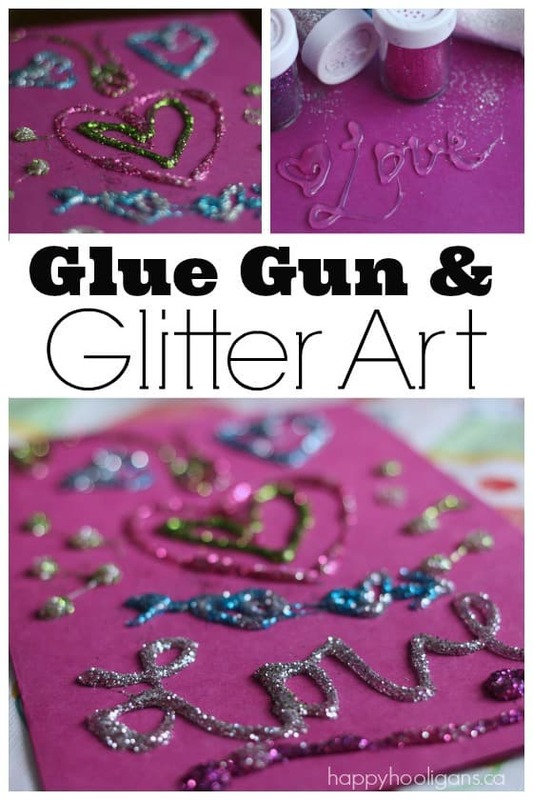 I see a whole host of 3-D glue gun and glitter crafts in our future, and I’m pretty excited about it!